Maxi dress hack done, so it’s time to do the short version! Using the same shirt pattern, the Mélilot from Deer and Doe, I planned to make a mini shirt dress using Version A – with the hidden button placket and collar – but without the sleeves. A combo of the 2 options available! I made a size 40 and extended the bodice on both sides by 6 inches. I perhaps should’ve gone a little longer but I figured I’m short so a proper mini doesn’t really look that short on me… On the other hand I’m getting older and my hems are getting longer… Dilemmas. I used this fab fabric I got from Walthamstow market a couple of weeks ago to make it. It’s a fine printed peach poly satin. 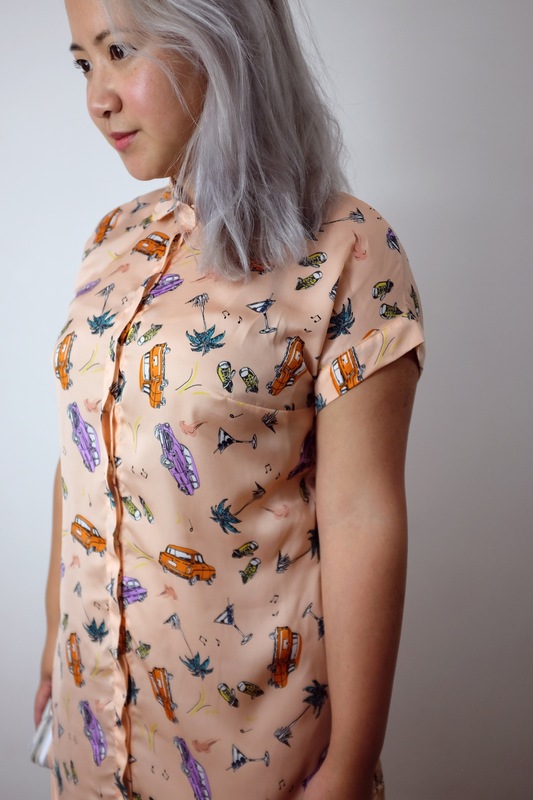 The printed vintage cars, martini glasses and sneakers just looked too fun to pass up on! The slippery fabric however, did make cutting out a little trickier than normal. It was one of those times I wish I’d invested in a big cutting mat and a rotary cutter! That being said, there’s so few pattern pieces that it wasn’t a tremendous hardship. Sewing up was relatively simple! Until I realised I’d forgotten to interface the button placket and decided to go ahead and sew the buttonholes in anyway. BAD idea! I’ve only gotten away with it here as the buttonholes are neatly hidden away with that extra fold of fabric otherwise I would’ve been beside myself! Apart from that massive faux pas, I love this dress! It’s super light and flowy and feels great on! I love the shape of the collar. The fabric is a little too sheer and I have to wear a slip underneath but I don’t think that’s a big problem. My glorious Rosa bomber jacket! That looks great. Lovely colour on you. I was lucky enough to get a shopping trip in paperchase with my friends 50% discount card, I got the biggest cutting mat I could carry and the longest metal ruler they had! But I’m a hairdresser: I love my scissors & only use the rotary & mat on slippy fabrics. It’s a good investment (especially at half price!). Thanks! I’ll definitely need to look at a mat and cutter to invest in! Those are some good ideas! Definitely need to try them in future! It looks comfortable, stylish, summery and really flattering! And that fabric is so good! Go for it! It’s a really really easy hack. Sounds like a nice fabric choice too! This one is just so cute! Great hacks, Emily! Thank you! I love this pattern – simple and stylish and easy to hack. Good luck with yours! You’ll enjoy wearing this one, Emily! It’s a fun dress, and the color is great on you. Great hack, I think this shirt mini dress is fab and looks great on you. First of all great job, It’s really tidy and I love the fabric. For me, it’s a tad short, I still see a shirt rather than a dress, but maybe that is just my age talking. 🙂 it is cute on you though. Lol. I feel it’s slightly short to be really comfortable as a dress too. I’d def make it slightly longer for any future ones! Lol. It definitely has that vibe! Very cute dress! I have never seriously considered using a rotary cutter and mat… maybe I should. .? I need to try it out and see myself! I think it’s definitely worth looking into considering the difficulties I had with this fabric! Cute, love it with your hair color and those shoes! Haha! Thanks! Everything I’ve been buying has been to go with the current hair colour!